Platinum AL - "The Hoover"
This house is perfect for large families who entertain! This 4 bedroom, 2 bath, 2 living room house is almost 2300 sqft. From the first steps into the front living room you can feel how open and inviting this home is. The front living room opens up to the kitchen, dining room and the back den area. Nice big windows and a large patio door in the dining let in lots of natural light. the off-kitchen utility room is amazing, with huge built-in cabinets, work space, utility sink , and a freezer space this room is beyond functional. The master bedroom is large and the on-suite bathroom is perfect with a large 6' walk-in tile shower, huge soaker tub, private water closet and large vanity with double sinks. The other 3 bedrooms are over-sized and split off from the master suite. Athens Park Homes - "Classic-1208"
You'll love this lake house. 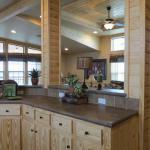 It is one of the most popular floor plans for the lake or farm. Featuring a front kitchen with a full pantry and built-in desk, two bedrooms and two full baths, this home has everything you need to relax on the weekend or live in full-time. Two bedrooms, two baths with washer-dryer area across from the guest bath. We are displaying it with a vaulted ceiling and optional clerestory windows in the living room, and a large 8' front porch. 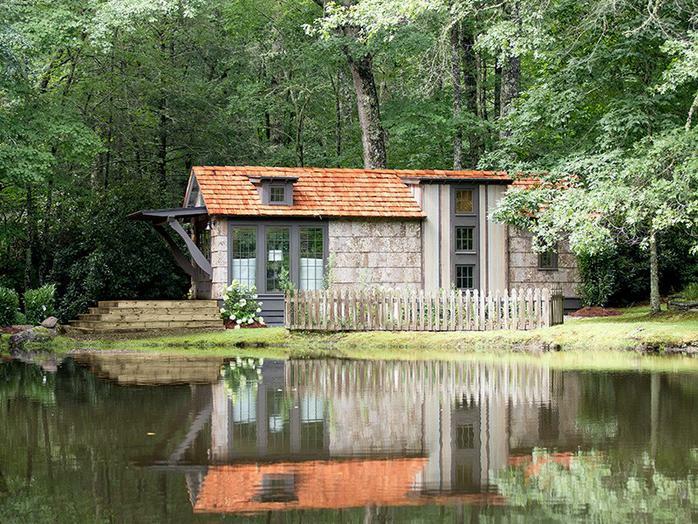 This rustic cabin has all of the amenities you need for a perfect Lake getaway. This house has a Large full width Porch, 3 large bedrooms, 2 baths, an oversized kitchen with an 8’ island, an expansive Living room with a wood-burning rock fireplace and a tall Trey ceiling this house has it ALL! 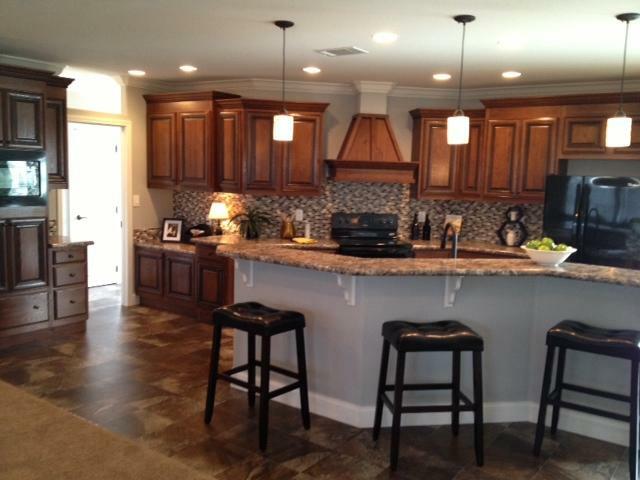 This park model is the perfect plan for people who love to cook or entertain. A large bar offers plenty of work-space for cooking, as well as seating for 4 to enjoy company. We added clerestory windows on both sides of the model to really brighten up and give you some breathing room. Our big 8-window front bay is an impressive wall of windows in the living room This model also has room for a side by side washer/dryer a true luxury in park models! The bathroom has an added clerestory window to make the ceiling almost 10' tall to give you room to stretch. This plan has it all and then some. Another 15' wide park model plan. This one has a L-shaped Kitchen and the same king sized bedroom bath layout of the Tumbleweed. The kitchen/living room is still a large great room combo, and with the tall clerestory windows the room is expansive and open. 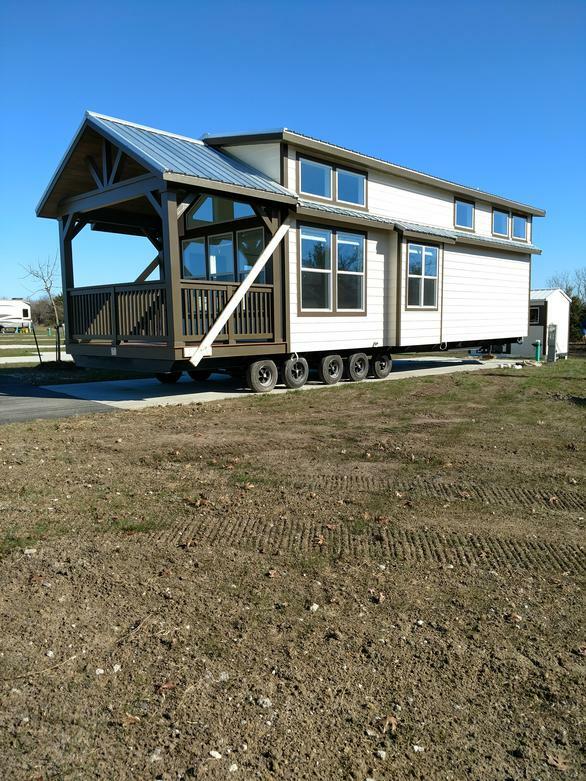 With a full 15' porch, this model makes the perfect weekend escape. We upgraded this house with beautiful hickory cabinets and our natural SYP trim package to really set this cabin apart from others. 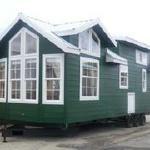 This model is available with or without a loft. ​This is the ultimate floorplan for lake-living, country-life or just life in general! the large wrap-around porch surrounds the dining room and offers views to 2 sides of the home. The living room is large with an optional corner fireplace. The kitchen and living are separated by a large eat-in bar, and the island is a perfect workspace for the chefs. 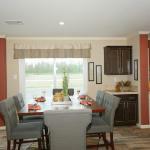 our display model is shown as a 3 bedroom, but a larger 4 bedroom plan is available. the master has an on-suite bath and the utility room has a mop sink and huge storage closet that could also work for a freezer space. This home is displayed in our SkyRanch package with hickory cabs, pine trim and accents throughout, stained Cemplank exterior and a rugged red metal roof! 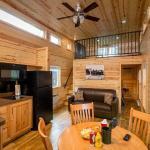 Come by today to see this amazing cabin! This quaint home is perfect for a small family or for the couple that is looking to downsize. 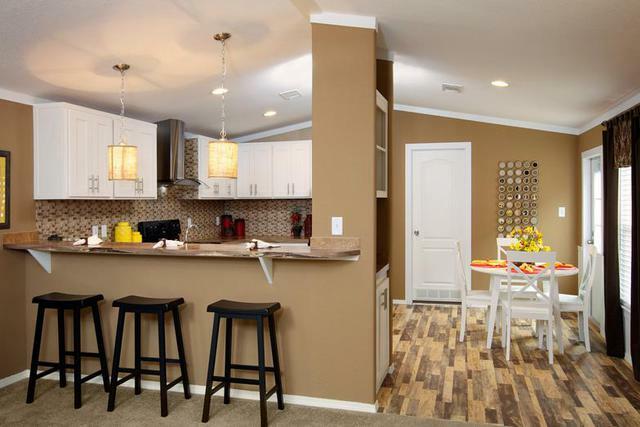 This model has a split arrangement with 2 bedrooms and 2 baths. Beautiful T&T archways perfectly divide the dining room from the kitchen and the living room. This display model SOLD, but it is still available to be ordered to suit your needs. 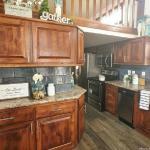 This RV park model is a perfect retirement home! 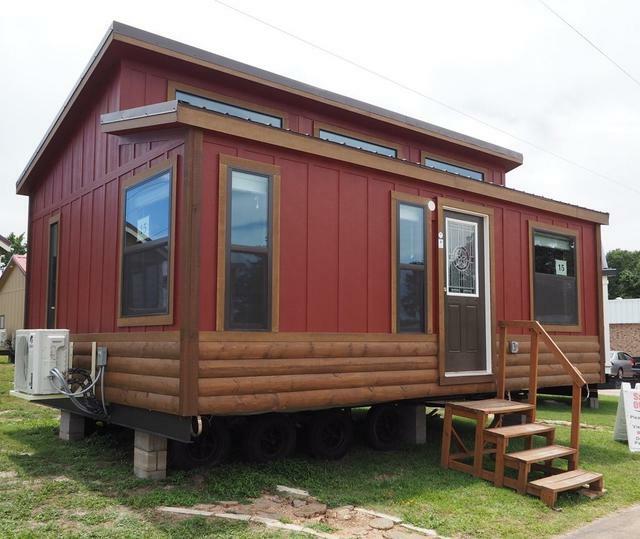 It has an upstairs loft perfect for storage, or grandkids! The winding stairway is a nice touch. The 4 window front bay with trapezoid windows above offers a perfect view out into the world. There is storage built into every nook and cranny throughout this home including cabinets in the loft for extra storage. The kitchen has upgraded appliances as well as Solid Surface Staron countertops that look and feel amazing. This is the quintessential park model! 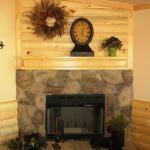 This 3 bedroom 2 bath home is perfect for out on the ranch, on the lake, or up in the mountains. It features our popular Ranch Pkg that includes Southern Yellow Pine trim throughout and Yellow Pine wainscot in the living room with an impressive Pine divider beam dividing the living and the kitchen/dining room. The Master has a walk in closet and a large glamour bath with a separate shower and tub. The exterior is a perfect mix of Rustic and Contemporary styles that would look great on any property. Oak Creek Elite 18’ Wide - "The Big Oak"
The biggest Singlewide on the market! This house is a whopping 1365 sqft! 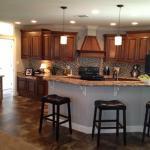 It has an eat in dining room and a large kitchen with a raised bar island. The master has a large walk-in closet and double French doors open into a massive glamour bath with 2 separate vanities and a pop-out bay centers over the large oval tub. This home can be a 3 bedroom or an optional double master suite with 2 glamour baths. This is a great open floor plan park model, with a nice covered front porch. With "beachy" colors throughout & white cabinets and large windows help make this model very inviting. The Dandelion has a double closets and ample storage throughout, including a built-in dresser and entertainment center. With a standard Metal roof, and our weathered barn grey exterior this model will look good on any lot/land. Shown without a loft, but it is available in Single or Double loft configurations for even more flexibility. Skyline - "The Lone Star"
A perfect plan for those needing just a bit more room than the maximum allowed by a park model. 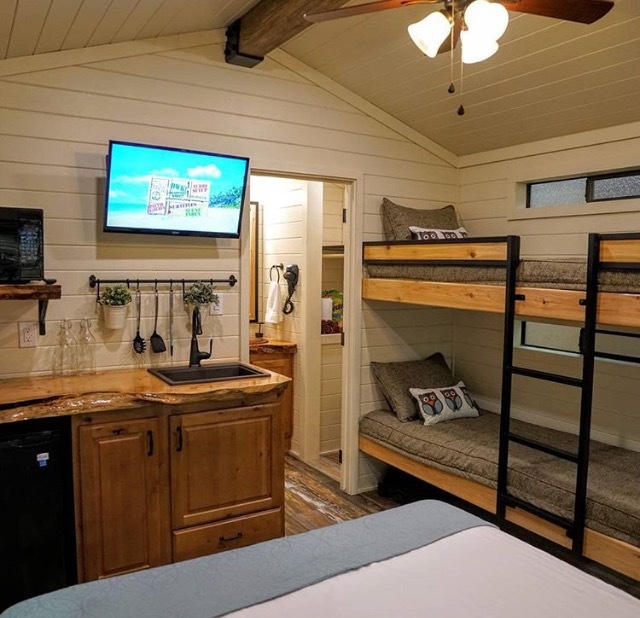 This 1 bedroom, 1 bath home has 478 sqft. The kitchen has a nice big bar for guests, and the end entry door is a perfect location to add a large front porch. 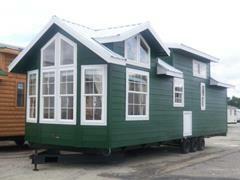 This would make a perfect mother in law suite or weekend lake house! Athens Park Homes - "The Royal"
This one is one of the all-time most popular park model floorplans! 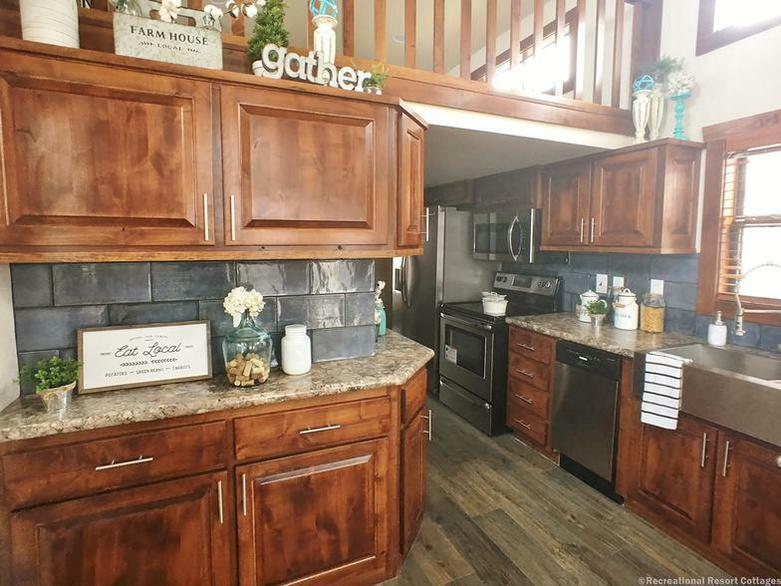 This galley kitchen offers a huge living room with a patio door off the covered front porch. The bathroom is tucked nicely away out of site behind the kitchen as is the stacked w/d area. the bedroom is nicely appointed with a mirrored closet system and rear bay window to add more room and light. the upstairs loft is a perfect place for extra storage or extra sleeping quarters. Shown with our deluxe "Royal" exterior and metal roof, this one is sure to impress! What an amazing cottage! The Bishop is one of our new favorites! To begin with, the exterior is finished in a beautiful grey siding with an elegant black metal roof, a bright red door and a truly unique "X" pattern porch railing design. Also the exterior features a 10' front porch with a shed roof and exposed rafter tails and double column look. The inside is equally impressive, 10' flat ceilings throughout, 20 windows (including 12 Clerestory windows), bright grey painted cabinets and light colors really make this house shine! Did we mention the 6' walk in tile shower? WOW! 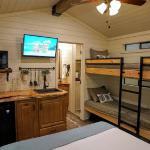 The rear queen sized bedroom features all the built-ins plus double closets with barn doors! The Bishop has it all and wont last long!! Platinum - "The Eagles Landing"
This beautiful model is perfect for larger families. Shown with the optional double loft, which in this model the 2 lofts are separate from one another and actually become like 2 bedrooms upstairs. 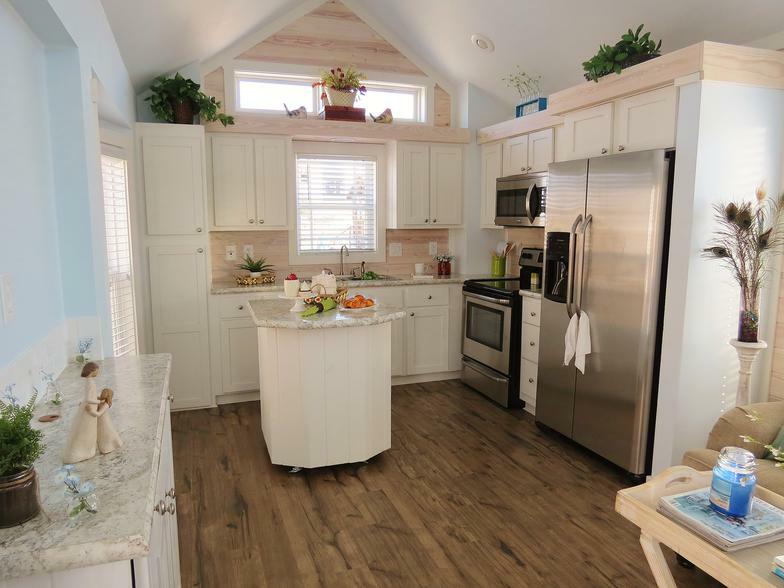 This model also has a very nice eat-in moveable island and a huge stainless steel farm-sink. 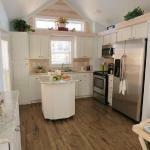 This house is shown with our elegant Nantucket white cabinets. There's room in this model for a full size W/D side by side instead of the normal stackable units. This plan makes a great lake or beach getaway, or works perfectly for a family w/ kids! This ready-built model is impressive! 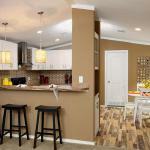 At 630 sqft it is a middle-sized house between our smaller 399 sqft park models and our larger HUD homes. The Beasley has a huge front porch, a massive living area with double clerestories making the ceilings over 10' tall. The rear bedroom has huge windows and is large enough for a king sized bed and has an on-suite bath room. 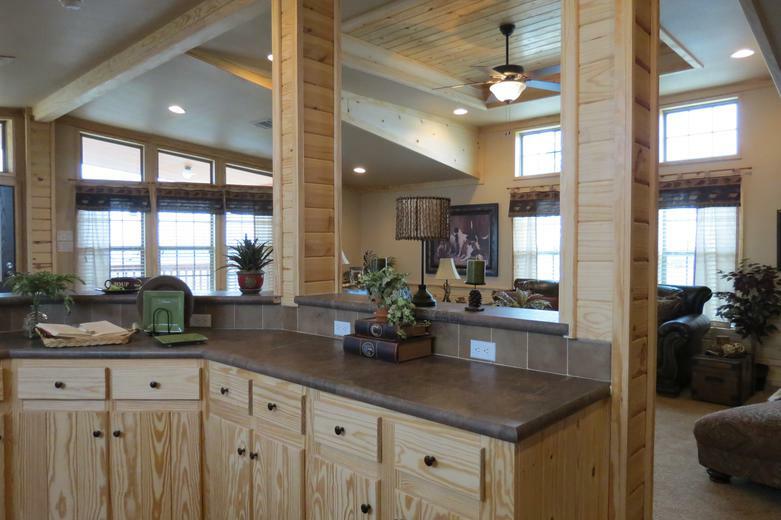 This is the perfect hunting cabin, mother-in-law suite or guest house! Come see this model exclusively at RRC Athens. The Stone Harbor has huge windows and tall ceilings throughout. The living room is so big that there is an option to make it a 2nd bedroom or bunkroom, and still have a nice sized living area. The dining room has a built in hutch and equipped with a 30 bottle wine cooler! The bathroom is unique and is shown with a TUB! The rear bedroom has solid wall of closets and extra storage cabinets galore. Come see this model today! 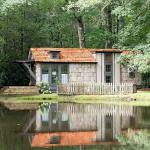 This is a perfect lake house, guest house, retirement house, or starter home. 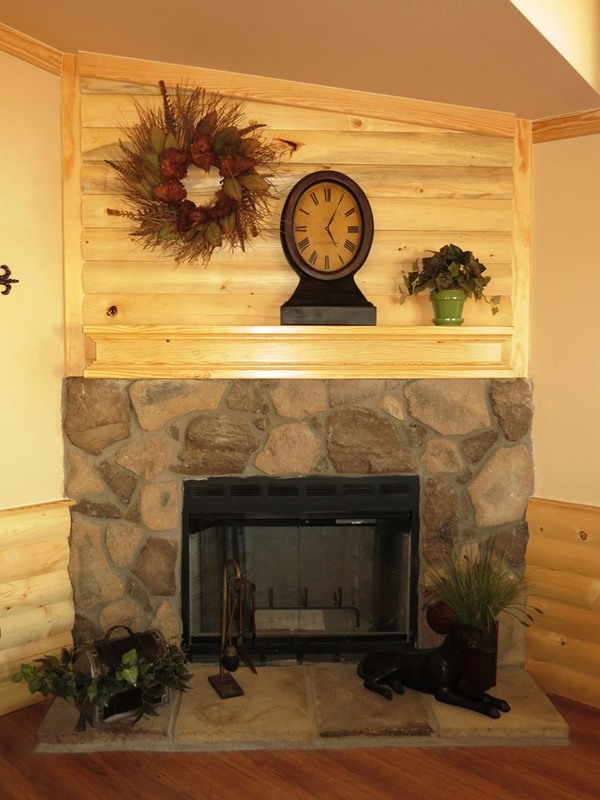 The Timber Ridge is a 2 bedroom 1 bath home with a front living room and a large front porch. The living room opens up nicely to the kitchen with 3 large windows providing ample light for both rooms. A moveable island and pantry in the hall make for plenty of kitchen storage. Both bedrooms have built in dressers for extra clothing storage, as well as a place to set the tv. The master bedroom has a pocket door access into the bathroom, and double barn doors are a nice touch. With the optional 8' covered front porch, this home would be perfect sitting next to the lake! 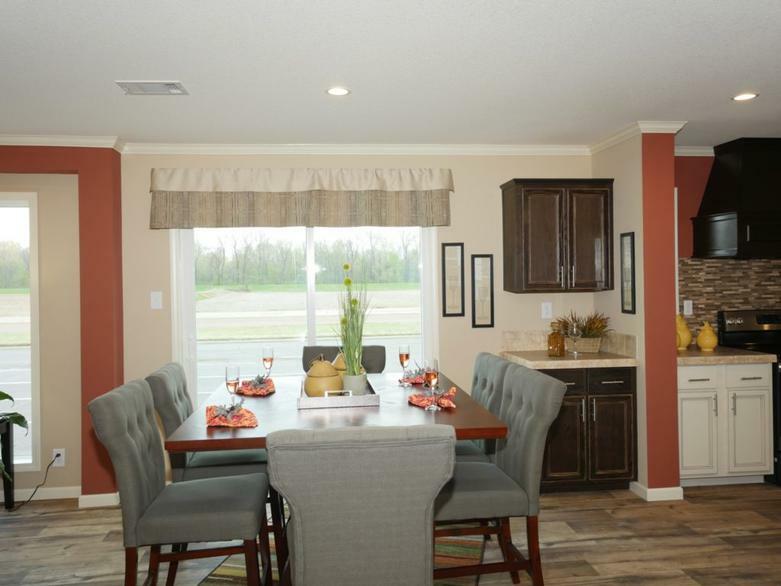 ​Athens Park Homes - "Classic 1207"
This is one of the most popular one bedroom homes, as it is just slightly larger than a RV park model but provides a much more spacious feel. Inside and out, it has the same look as a park model but gives you more space. Come experience the difference for yourself. Spend some time sitting in this classic model and in a RV park model and see which one you prefer. This model is sold and will be leaving soon, so come see it today!! Platinum AL - "The Pierce"
Coming soon! This model is stunning! To start with it is 2' longer than most singlewides on the market! It also features 9' flat ceilings with extra windows everywhere which really makes a difference. The kitchen is large with lots of great workspace, and the dining room offers tall floor-ceiling windows. Off of the laundry room is a huge walk-in pantry with storage for a years worth of food! The master bedroom has an on-suite master bath with double sinks, a large soaker tub and nice walk-in shower. With a split bedroom layout this model offers plenty of privacy. The guest bath is tucked nicely in the hallway offering easy access to both guest and kids. The exterior is finished with beautiful cedar shutters and a gorgeous craftsman wood door! RRC- Platinum- Elite " Irving"
This is our first 15' wide park model from Elite Cottages, and they knocked it out of the park! We chose a brand new wrap-around porch design, and also a new free-standing exterior corner rock fireplace that is amazing! This model also is shown with the largest porch we can add to a park model, at 12x15 plus the wrap around section it is HUGE! The exterior is finished in rustic hand-stained grey hardi-lap siding with mahogany stained accents and solid 6x6 cedar porch posts. The interior is equally impressive, with large windows throughout, tall ceilings, and beautiful stained Alder cabinets and trim throughout. We added a beautiful tile shower, and some custom built barn doors to finish off this amazing park model cabin. On display only at RRC Athens! 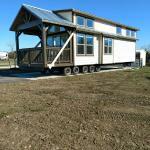 These models were previously in stock and on display at Recreational Resort Cottages in Athens Tx. They are sold and delivered, but are still available to duplicate and special order. Please call RRC Athens at (903) 292-5172 for more details or with any questions.